The Audiology staff at Hearing Services of Delaware has been serving patients with hearing loss for over 20 years. 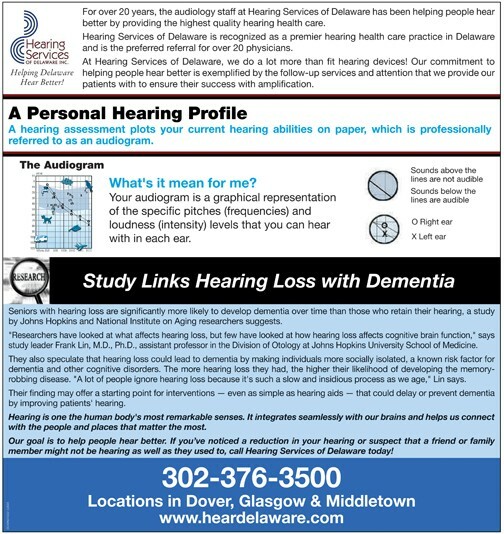 With its patient base primarily coming from satisfied patients referring their friends and family members and local physicians referring their patients for hearing health care services, Hearing Services of Delaware is known for diagnosing hearing problems and helping patients find the best hearing devices to meet their needs. “I hear much better and more clearly at meetings, movies, and church.” – Margaret S., Middletown, DE. “I can’t say enough good things about the service and care I have received from Hearing Services of Delaware. It is excellent.” – Elizabeth S., Newark, DE. For more information, call 302-836-9870 or 302-376-3500.